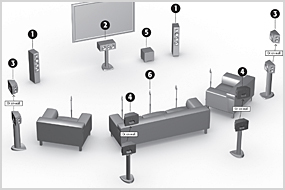 Paradigm® | All About Sound: What is Home Theater? All About Sound: What is Home Theater? What a time to be alive! So many entertainment options, and they all can be enjoyed at home, where they deliver the kind of thrilling technology once only found in movie theaters and video game arcades. More, even! Chances are you're already experiencing some level of "home theater." You're watching TV on a flat, wide screen, maybe streaming movies or watching Blu-ray or DVD discs. Maybe you're a gamer. You might have a small pair of stereo speakers on either side of your TV, or a soundbar speaker right in the middle. It's likely that your movies and games, delivered on current digital media, feature multiple channels of audio, which means that there are specific audio signals directed to different areas located all around your listening space. Like in a movie theater, there is the front center, left and right, and rear surround left and right. There's also a channel specifically for low frequency effects and deep bass. Now it's easier than ever to duplicate the big movie theater experience in your own home. Like we said: It's a glorious time to be alive! But if you don't have a surround sound speaker array, also called a "five point one" (or beyond) home theater sound system, then you're really missing out on the experience. A home theater, to put it plain, is a collection of speakers and audio-video components designed to reproduce the movie theater experience in the comfort of your own home. The size and the quality of your video screen is very important here, but since we're a speaker company, we're going to let someone else talk about that. For us, a high-quality, properly placed, multi-channel surround-sound speaker system is what really brings a home theater to life. A big TV. Bigger is better, and TV technology today makes even the biggest screens more accessible. Consider a projector and a screen. Why not? A/V Source, includes video sources like DVD, BR, high res streaming or LAN connections, and audio sources such as CD, SACD, or even multi-channel vinyl. Why not? Speakers. This is our gig. So let us tell you that the one most important thing to keep in mind when cobbling together a multi-channel, multi-speaker surround sound system, is make sure the speakers you choose are all timbrally matched, with the same audio characteristics from speaker to speaker. Timbre-matching ensures that sound does not change or fluctuate in character as it travels around the "surround" system from speaker to speaker. This is most easily accomplished by choosing loudspeakers from one manufacturer (we can recommend one), or even one series of models within a manufacturer's line (chosen for size or budget considerations). Front Speakers (1, in the diagram above): Front left and right speakers reproduce the majority of front stage dialog, sound effects and music. Surround Speakers (3): Surround speakers placed on walls above and behind the seating area are the minimum you need to reproduce ambiance (like, "rain") and sound effects (like, "flyovers") that are critical to the realism of multi-channel movies and music. Timbre-matched for seamless blending, surround speakers should have a uniform reverberant sound field. Full-bandwidth bass reproduction is a bonus. Rear Speakers (4): Rear speakers in addition to traditional surrounds allow the contribution of additional channels to the mix. New multi-channel processing can include channels that reinforce the illusions of "height" and "width" in the space. Subwoofer (5): The subwoofer is the "point one" channel, usually connected to the processor by low-level output with its own channel. Bass tends to be omni-directional, but placing the subwoofer up front and to the side usually results in the most realistic dispersion of low frequency effects. Big bass is an ingredient in a thrilling home theater experience. Building even a small home theater surround sound system can have a huge effect on the enjoyment you get from your entertainment media. Of course, we recommend musically accurate and timbre-matched Paradigm loudspeakers when you do it. Paradigm loudspeakers are created by audiophiles to satisfy audiophiles for both music and movies.